The controversial killing of Cecil the Lion by a U.S. dentist has caused outrage across the world, as well as a lot of sadness, as was viscerally evident in Jimmy Kimmel’s take on the news story last night. 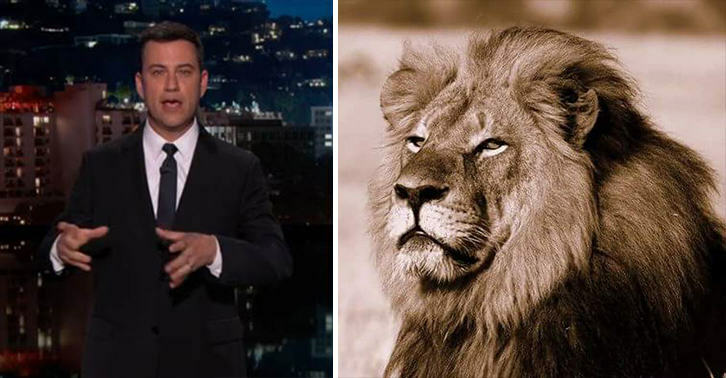 On Tuesday night’s edition of ‘Jimmy Kimmel Live’, the host didn’t hold back with his thoughts on the killing of one of Africa’s most famous lions or the man behind it, Walter James Palmer. First, Kimmel took the dentist to task for the way the hunt went down, and then he wanted to know why it happened at all. The big question is: Why are you shooting a lion in the first place? I mean, I’m honestly curious to know why a human being would feel compelled to do that. How is that fun? Is it that difficult for you to get an erection that you need to kill things that are stronger than you? Kimmel continued to ponder that question as he displayed photos from Palmer’s past kills, including a bear, lion, leopard and rhino, pointing out that the dentist has basically “killed like half of Noah’s Ark”. Closing the monologue, Kimmel hoped that something positive could come out of what he called a “disgusting tragedy” and the host choked back tears as he asked his audience to support the Wildlife Conservation Research Unit, the group that had been tracking Cecil before he was killed. At the very least, maybe we can show the world that not all Americans are like this jackhole here!